A: Acupuncture is a form of holistic medicine that takes into account the entire being- mind, body, and spirit. This method of treatment aims to restore the vital flow of energy in the body, also known as “Qi”, which circulates in the acupuncture meridians. When the meridians are blocked or deficient, illness and dis-ease occurs and causes pain, imbalance, and physical and emotional symptoms. Acupuncture therapy uses very fine needles inserted in specific points along the meridians that allows the specialist to access the vital flow of energy and restore balance and harmony. It is a safe method of treatment and patients report a warm, peaceful, and relaxing sensation during treatment. ​Q: What can I expect at my first session? No. 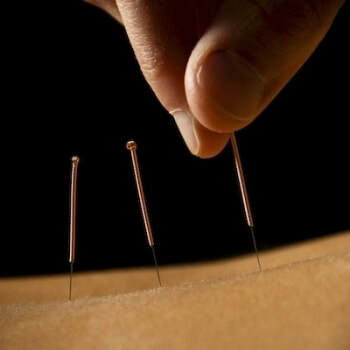 Acupuncture needles are much thinner than the hypodermic needles used by doctors. These needles are practically hair thin and cause minimal to no pain upon insertion. The sensations that follow the insertion of the needles vary from no sensation to a tingly feeling along the base of the needle. Many patients report a relaxed, warm, comfortable feeling and some fall asleep during the treatment. Yes. In 1995, the U.S. Food and Drug Administration (FDA) classified acupuncture needles as medical instruments and assured their safety and effectiveness. The acupuncture needles that are used are individually packaged, stainless steel, sterile needles that get disposed into biohazard containers and therefore the risk of infection is minimal. The FDA acknowledges that the side effects of acupuncture are considerably less adverse compared to other medical procedures such as surgery or pharmaceuticals. Common side effects range from no adverse side effects to slight soreness and minor bleeding or bruising where the needle was inserted. ​Q: How many treatments do I need? Depending on the individual and the severity of the condition will determine the amount of treatments necessary. Typically, treatments consist of 6-12 visits, once or sometimes twice a week, and can last between 45 minutes to an hour. In many cases, a patient will see improvement within the first three treatments while at other times it can take as long as five or six sessions to see a difference. In general, the longer a patient has a condition, the longer it will take to treat that condition. Acute conditions tend to take less time to treat while more chronic or severe ailments take longer. ​Q: Do we accept insurance? Yes. Acupuncture is becoming more and more recognized in mainstream medicine and many insurance companies are covering a variety of conditions. At New City Acupuncture and Wellness Center, we accept out-of-network plans with Aetna, Blue Cross Blue Shield, Cigna, and United Healthcare. To provide you with the most accurate information about your specific insurance coverage, our center will ask you to provide us with your name, date of birth, and insurance plan information. Our billing company will verify your insurance coverage as a courtesy and at no cost to you.